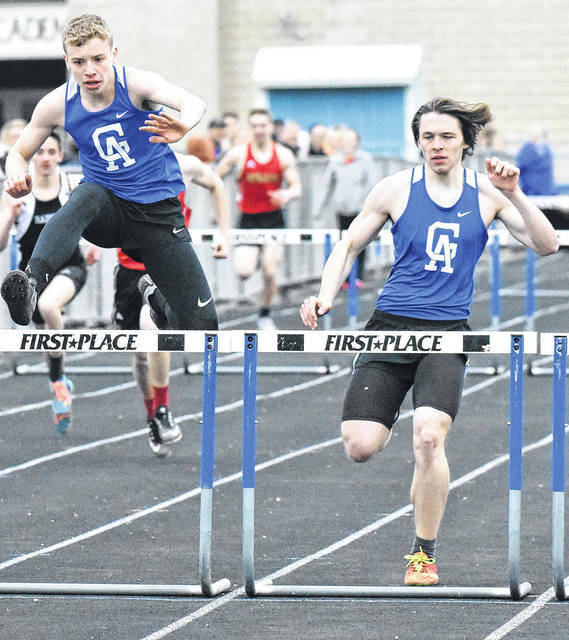 The Gallia Academy duo of Ian Hill, left, and Ezra Blain both approach obstacles in the 300m hurdles event at the 2018 Gallia County meet held Tuesday, April 10, in Centenary, Ohio. PARKERSBURG, W.Va. — Home track advantage indeed. The Parkersburg track and field teams claimed both the boys and girls team titles on Saturday at the Russ Parsons Invitational, hosted by the Big Reds on Saturday. Parkersburg won the girls team title with a 112, followed by Buchtel at 95, and Parkersburg South at 71½. Ripley was next with a 68, followed by Athens (51), University (46) and Woodrow Wilson (45). The Lady Eagles were eighth with a total of 24½, Lewis County was ninth with 17, while the Blue Angels were 10th with a score of 10. Caldwell with eight, St. Albans with four, and Preston with two rounded out the 13-team field. The EHS relay team of Rylee Haggy, Jessica Cook, Jaymie Basham and Jenna Chadwell was second in the 4x200m relay with a time of 1:58.53, while the quartet of Chadwell, Basham, Morgain Little and Kylie Tolliver was sixth in the 4x100m relay with a time of 1:58.53. Individually for the Lady Eagles, Layna Catlett claimed the discus throw title with a distance of 107-1, while placing fifth in the shot put at 30-2. Cook was third in the 400m dash with a time of 1:03.7, while taking fifth in the 800m run at 2:32.72. Ally Durst was sixth in the 3200m run with a time of 13:22.56, while Kassie Casto was tied for sixth in the high jump at 4-4. Sarah Watts led the Gallia Academy girls with a second place finish in the 800m run, as she posted a time of 2:28.92. The Blue Angels’ other top-6 finish came from Katie Queen, who was fifth in the pole vault at 6-6. PHS won the boys competition with a score of 122, followed by Parkersburg South with a 116. Ripley was third at 88, followed by Buchtel (70), Athens (34), Lewis County (27) and Preston (26). The Eagles were eight with a score of 24, the Blue Devils were next at 18, followed by University with 18. Caldwell with eight and St. Albans with four rounded out the 12-team field. Half of the Eagles point came from Noah Browning, who was second in the 400m dash with a time of 55.16 and fourth in the 800m run with a time of 2:11.1. The other half of Eastern’s total came from Tyler Davis, who was third in both the shot put and discus throw with distances of 42-8½ and 125-10 respectively. The Gallia Academy boys were led by Cory Call, who was third in the long jump at 19-9¾, and Spencer Harris, who was tied for third in the high jump at 5-8. Ryan Donovsky was fourth in the long jump at 19-1 for GAHS, Kyle Greenlee was fifth in the pole vault at 9-6, while Ian Hill was sixth in the 300m hurdles with a time of 46.08. Visit www.runwv.com for complete results of the 2018 Russ Parsons Invitational.